If you love makeup but can’t afford to pay an arm and a leg for it, you will certainly like the makeup websites that we include in this list. With all the new makeup trends, such as winged eyeliner or flushed-looking cheeks, you may need to update your cosmetic collection and there’s no better way to do that than with a discount. If you’re too busy to figure out exactly which cosmetic websites are for you, we’ve done the homework for you! Check out these 7 websites. Whether you like the natural look or following the latest makeup trends, you’ll find all the cosmetics you need (and more) among these seven sites. When you hear “Sally Beauty” your mind goes directly to hair coloring and perms, but Sally Beauty offers so much more than just hair supplies. Yes, you can get your fill of both hair and nail supplies – as well as salon equipment and furniture! – but you can also get all the makeup you need, too. Sally Beauty is one of the better-known cheap hair supply sites, but it’s also a cheap makeup site as well! Supplies include eyebrows, eye makeup, face, and lips in addition to organizers, makeup removers, tools, applicators, and other accessories. The next time you’re looking for cosmetics at a low price, check out Sally Beauty. You can also fill up on all your hair and nail needs! Avon calling! Whether you’re old enough to remember or not, Avon representatives used to sell cosmetics door to door. They took your order and then delivered your items right to your home. Although the door to door salesmen are a thing of the past, getting cosmetics delivered right to your door isn’t. Avon is a trusted brand and they have many tried and true products. Avon offers quick picks under five dollars along with gift and value sets for your eyes, lips, and face. Additionally, this site also offers skin care, bath and body, fragrance, health and wellness, jewelry, fashion, home decor, and even items for both men and children! It can definitely be a one-stop shop for all your cosmetic and beauty needs while also conveniently offering gifts for special occasions as well. 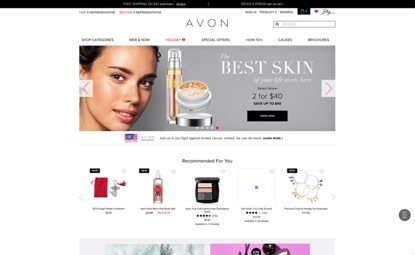 Try Avon the next time you’re looking for cheap makeup websites; you won’t be disappointed! If you’re looking for discount makeup websites, look no further. Coastal Scents may be the site for you! 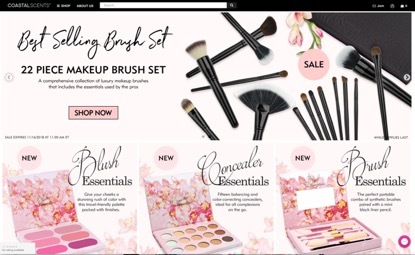 This cosmetic website offers a variety of sets such as brushes, eyeshadows, and blushes and bronzers palettes. Coastal Scents has categories such as brushes, eyes, face, and lips. In addition, this site offers customized palettes. Buy an empty palette and fill it however you want to! This site also provides natural products as well – natural soaps, butter, and oils for those who don’t like or are allergic to additives. Whatever you’re looking for, try Coastal Scents first. Getting what you want and getting it at a discount is the best! BH Cosmetics offers a free fifteen-dollar palette with every fifty-dollar order – nothing is better than free stuff, right? If you’re searching for a great makeup site online, look no further; this site may just be the one for you. Among best sellers and new arrivals, you can find plenty of beautiful cosmetic palettes with your best or favorite colors. BH Cosmetics offers makeup for your eyes, brushes, face, lips, and more, such as tools, glitter, makeup remover, and videos featuring makeup tutorials for the latest makeup trends. If you want to try out some new makeup and learn how to use it, there’s no better site than BH Cosmetics for discount makeup. The next time you’re on the hunt for cosmetic deals, check here first! Elizabeth Arden is a name that is well-respected in the cosmetic world and you can get makeup on the site at lower prices than you’d imagine. 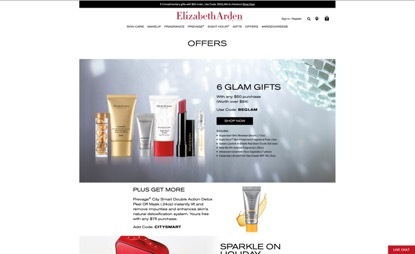 Elizabeth Arden may not be your ordinary discount makeup site, but it’s definitely one to remember. Get skin care, makeup, fragrance, and the patented prevage, which is their anti-aging line of cosmetics. In addition, get best sellers, offers, gifts, and Arden Reese, a special line of products endorsed by actress Reese Witherspoon. Find products for your face, eyes, and lips, including collections such as Flawless Finish, Tropical Escape, Bronze Vibes, and Beautiful Color. If you want great makeup at a fraction of the cost, this site may be the one you’re looking for. Try it; Reese did! Now we’re on the upper end of the budget spectrum, but Sephora still offers products you would think you’d only find on cheap makeup sites. 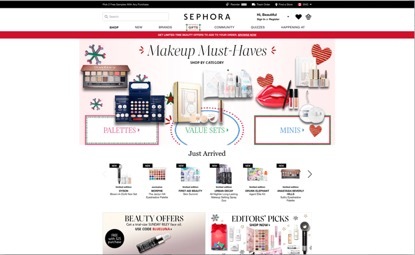 On Sephora, you can find makeup, skincare, fragrance, hair, bath and body, tools and brushes, men’s products, mini size, and gifts, as well as the Sephora Collection itself. 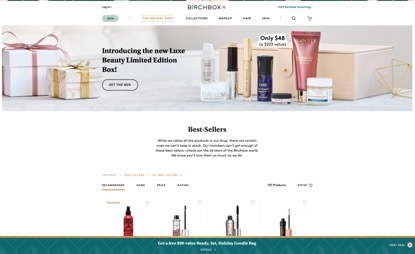 Categories include New, where you can get a monthly subscription box, as well as see what’s new to Sephora; Brands, which includes Lawless, Playa, and Fenty Beauty by Rihanna; Gifts, which offers gifts from under ten dollars to under a hundred dollars to fit any budget; Community, where you can see what’s new, what’s happening, and what’s being talked about; and How-tos, which includes quizzes, buying guides, and how-to videos. Before you decide that Sephora is too rich for your blood, check out the website; you may be pleasantly surprised! We round out our list with another one of the best Places to Buy Makeup that may appear to be on the higher end of the budget spectrum, Birchbox. However, Birchbox is a different cosmetic site. 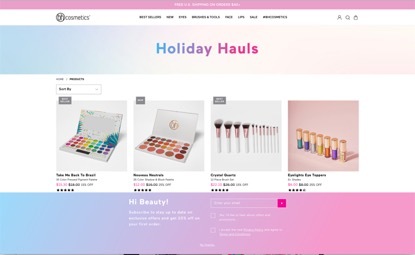 You can check out their featured products, makeup, hair, skincare, fragrance, body, lifestyle, and nails plus get free gifts with every purchase starting at twenty-five dollars. Order something for yourself and get a gift for free that you can keep or gift to someone else. What makes Birchbox different is their subscription program. For only ten dollars a month, you can receive a monthly box which includes five beauty products that have been tailored to your style, hair, and skin. The monthly subscription allows you to try new products like makeup, haircare, and skincare while learning how to use them. If you want new makeup every month plus discounted prices, Birchbox is definitely the site for you!